This past summer, I have not been exactly away from my sewing machine. I’ve not exactly been glued to it either. 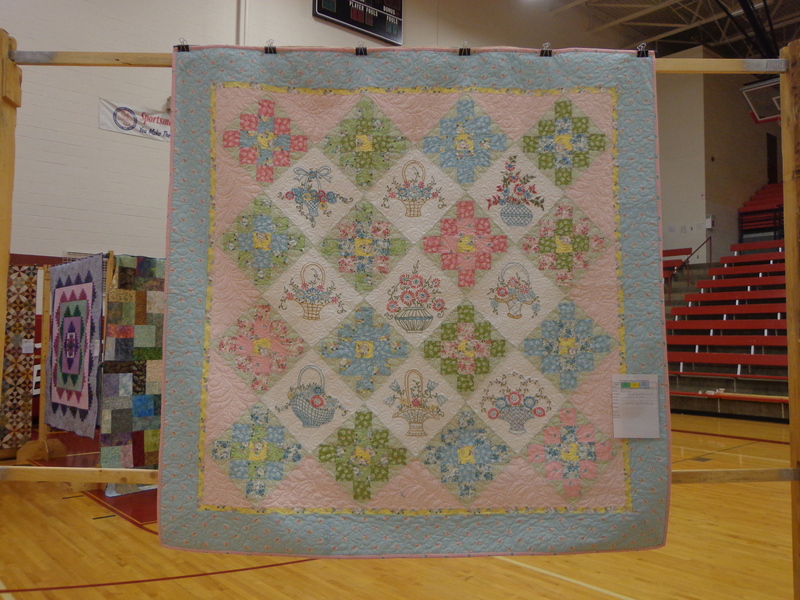 The last post of personal sewing was in May, when I was working on Grandma’s Footstool quilt, which you saw in full as a quilt in the Kansas City Regional Quilt Show. 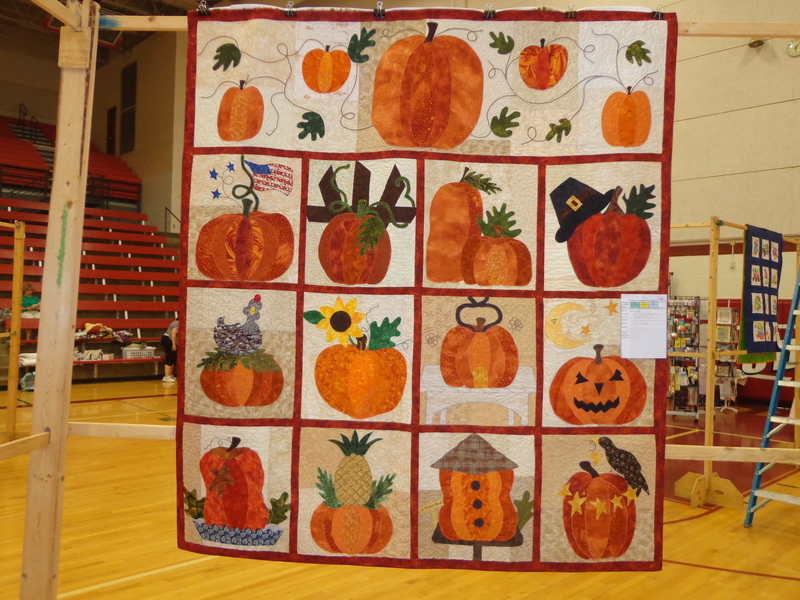 The quilt now rests in the sun of these shorter fall days while I contemplate where it is going to permanently reside. This next piece isn’t a quilt, but a metal “barn quilt” that I had to purchase at the show. I promised myself it would make it outside in my yard, but this wall still had an empty space, and I think I still like it here. For now. Maybe this is where Grandma’s Footstool will reside more permanently if I do move this block outside. 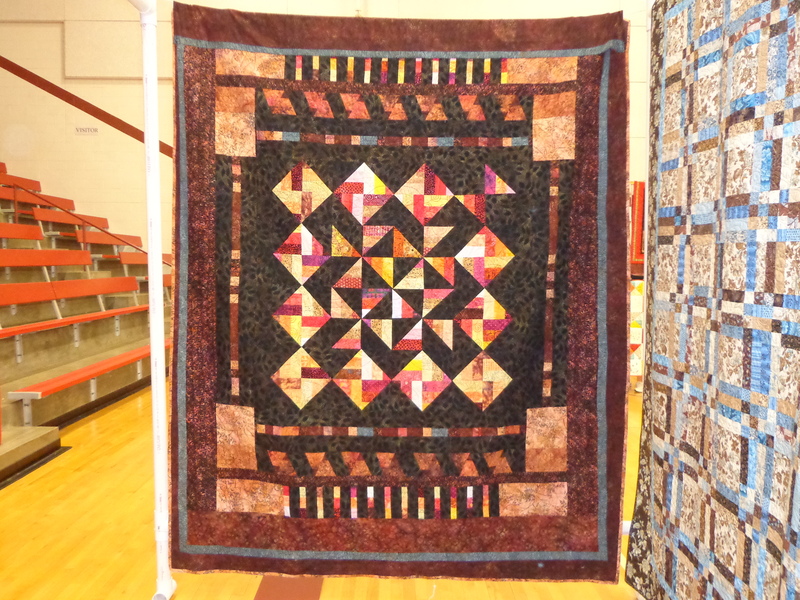 In June, I attended a mini quilting retreat, a weekend away with my sewing machine and several “mostly new-to-me” friends, although I am starting to get to know some of the ladies better the last year or two they are in my guild. The group of ladies I joined for the retreat have been sewing together for years and years and go to retreats every month. I got lucky last year in hitching a space at the retreat last year, and attended this year, and am going to try to plan to attend next year. On that retreat, I used some leftover pieces to make a nice scrappy small quilt. This was actually made the last thing at the retreat. I had the aqua and maroon four patch squares from so long ago in addition to the one in the middle with gold, I had brought with me the gold pieces and decided just a nice scrappy quilt (my size) with it. I am improving the borders as I rarely do a “plain border”. 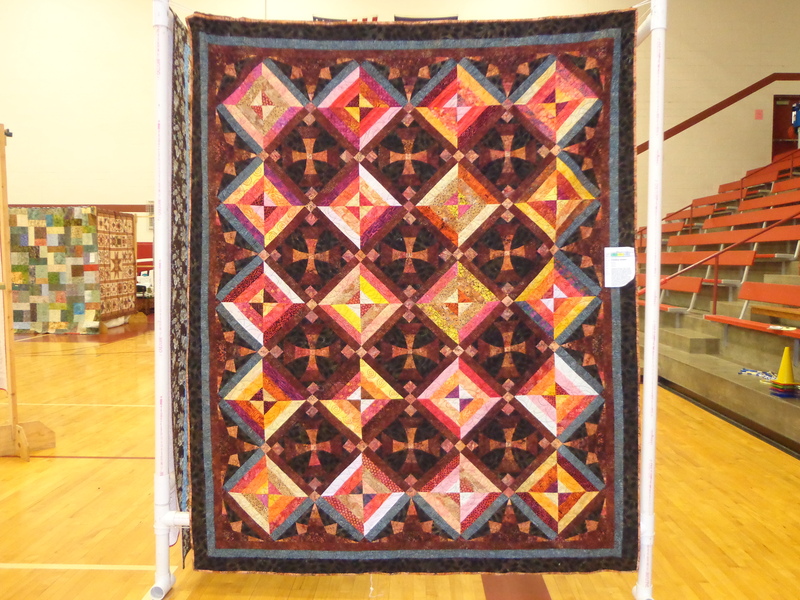 The color in this quilt isn’t near as wonderful as what it could be in actuality. Something about the photograph tones down the colors here to ‘real life’. During the retreat, I worked on quilting the small quilts I have had here ready to baste since earlier this year during March A Long. This one was mostly “fish-scale” aka clamshell quilting. As I put these random pieces together last fall, I saw the main piece as a fish head and tail. One block got away from the design so it was going to be its own miniquilt I might as well put them together. Currently it’s just a pin holding the piece on the bottom together, but I like the flow of both pieces visually. 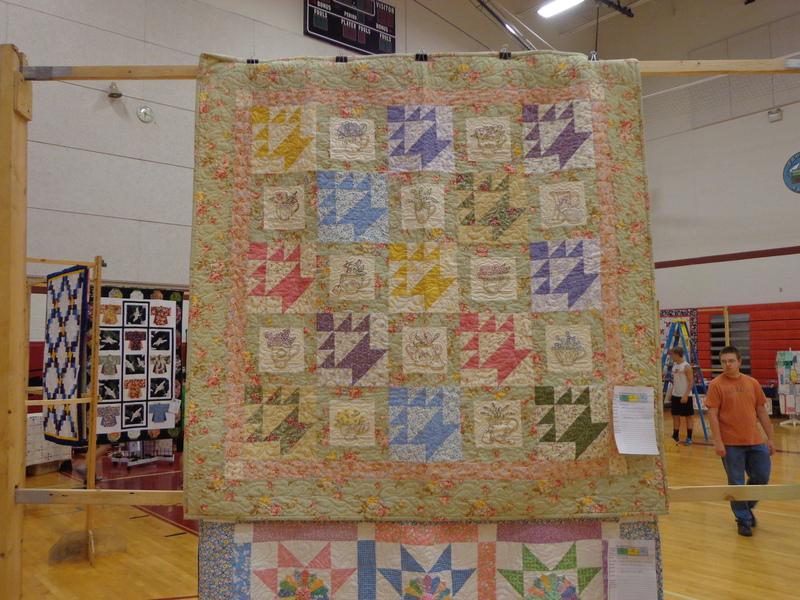 The quilt above was leftover blocks from someone’s other quilt that I took the scraps. I can call this quilt something like Fish Scraps. Or Fish scraps and heads. If I ever get the gumption to put a quilt in my bathroom, I think this might relocate to there. Right now it’s got a great small space next to my design wall. This mini quilt is super mini, like 1.5 feet by 2 feet. The half square triangles used were 1.5 inch bonus blocks. Isn’t this a nice setting for these tiny blocks? I couldn’t decide on a flange color so I went with three, blue sides, pink top and bottom, and purple corners. This is currently in the entrance to my quilting room. Simple. I was originally thinking of donating it to my guild show, and I still can, but I think I will have a hard time doing that. The other quilt that was from the same leftover pieces from the same quilt. These were a little larger 1.75″ each half square triangle. I like the setting on these, and yes, the oranges/yellows cut through the diagnonal here. No name on this one yet. Again couldn’t decide on binding, went with a highly contrasted choice since that’s what this quilt told me it wanted. This quilt is a little larger overall, about 2.5 feet by 3.5 feet or so. This quilt I have had pieced for several years but never had the edges pieced. I originally intended this quilt to have wonky borders and binding, and then maybe it was a year ago, I decided to add the black triangle border. Now on retrospect, I could have added another black border to the quilt before quilting and binding this. The binding is a gold and black inner flange, set quite wide to get the effect of the pattern better, I had drawn out a year ago what I originally wanted the quilting to look like, but I never until this year decided to do the actual quilting in such a high contrast color. This optical illusions quilt started off its life as a single ombre fabric that graduated from green to black. I was specific in how I cut the fabric up to piece back together, and most of that was done in 2012 – according to my notes and pictures. I am glad I went simple and bold on the center of the quilting, I like what the gold brought into this quilt, even though it was scary to quilt. Most of the quilting was done still at the retreat, but in the wee hours of the morning when there were no eyes on me at the time. Then I just got to sit and stare at this quilt for the rest of the retreat. Speaking of sitting and staring, I finally got my applique hot air balloon sewn down to a white piece of paper. For a while this summer, I had the balloon floating over this scenery piece I picked up from a guild member at one of our guild quilt shows. I do like the affect, and I kept searching for tree fabrics until I realized that we are supposed to be looking at tree tops here. I am thinking I may not match these two pieces up this way anyway, and go with a different background even yet from what I here for the hot air balloon. I have stalled out on the basket, something I didn’t draw already, and I have sorta one made, but not really liking it yet so far. The piece on the right on the top, was from way way back with a tilted four patch swap with Quilt Cabana Corner Sandi that I made for myself as inspiration. I was making a quilt top the way I always do, and I decided to cut it and I am wanting to quilt it and somehow attach the three pieces together. Possibly. I had this out to remind myself to quilt it, but this didn’t happen. Also, this might seem less impressive, but I expanded a scrap quilt this summer to be bigger than it already was! I believe this scrap quilt that you already saw pictures of last fall was on my design wall like this until I realized that if I turned it, I would get to use the whole design wall more efficiently and get a better chance at not duplicating too much. I did have other sewing adventures this summer, but I am going to break them up into other posts. It worked well for me last month to write several posts all within the span of a few days, and I am currently on the same kind of roll here. 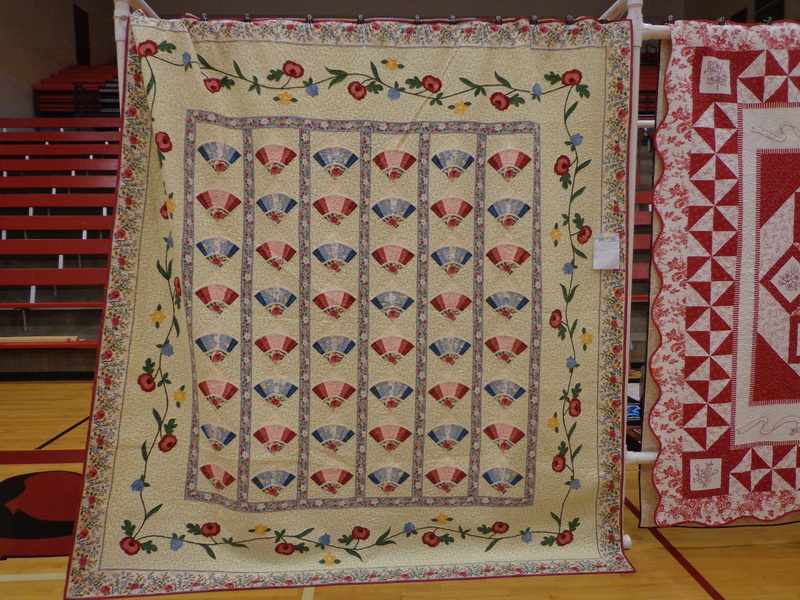 Several of these quilts were finished, but none of them are really large in size. It helps me to stay motivated to get small things done. And then they can be moved around my house and displayed there! For the brand new year, I happened upon a brand new BOM that I decided to join up and work on. I love the stained glass look for quilts, and this one just spoke to me this time. A designer for which I know little about, lives in Europe, I have bought one of her patterns before and the quilt is on my list to do, Ula Lenz has made the Ray of Hope quilt in hexagon style. I have already completed the first block, here are some of the pieces I was working on. I had a bright bag of orange, purple, pink batik scraps that I knew just “went together”. I think someone from my guild donated them to me at the last retreat a year ago. I had kept the fabrics separate from the rest of my stash, hoping to find a use for them. I remembered seeing these fabrics recently, so I located an appropriately dark batik that I had bought to use for some purpose that matched these pretty batiks. I have already cut out the border fabric for these blocks, the way Ula has us do the quilt is to make sashing and fun border wonky stars in between each of the hexagon blocks. There are many color ways that would look fantastic for this quilt. I have luckily got the first block done, so I hope that I will be able to remind myself to download her next BOM when it’s posted at the beginning of each month. It’s free. As you can see, each of the hexagons will be done in three sub blocks, and several of them have different amounts of seams on them. Paper piecing doesn’t scare me. Here’s the pretty block without the border pieces. I hope I can keep enough of these fabrics in the quilt. I may try to find another light fabric to help with the contrast a little more on future blocks. And here’s the block with border pieces. So now it can be sewn in square. Okay I have been living with some darker fabrics next to my dancing ribbons quilt, trying to make the fabric decisions on what will work best for the corner blocks. And then on a whim this past weekend, I decided to start cutting up and using an even lighter fabric for the corner fabric, making my lightest color fabric on the left in my picture above now become the darker of the 2 blue fabrics. Then I have everything cut out, and all my sets of pieces cut out, sewn together & trimmed. This means all the paper pieces are trimmed and all the fabric is sewn together in groups of 2 trimmed. But you know the old saying “Measure twice, cut once”? Yeah, I don’t think I did that. See how much smaller my completed corner is from the size of the quilt? I forgot to double check my measurement of my quilt block before printing out the EQ7 paper piecing. Also, seeing exactly how bright I went with the brighter fabric now this “way lighter” corner thing looks really out of place. If I manipulate the one corner I have done in photoshop to see the quilt as it may appear (with the too small corners) it will look kinda like this. I don’t mind lighter corners, but this seems too light. I think I may rethink this redesign. I may go with the original darker fabric to tie it better to the original colors. I was “this close” to using the darker fabrics Saturday, but then “on a whim” (which sometimes works) I said that I liked this lighter fabric too much and I wanted to use it. Since I have to redo the corners anyway for being too small, I will switch back to the darker fabric & purchase more of the ‘medium’ I have in this piece. The dark from the corners of this piece will become the light in the next part of the fabric. The time I spent working on this quilt, there were limited hours for in-person fabric shopping. So this quilt will sit another week during the thinking stage. The yellow bright corners may be too bright for this quilt, I have a duller version of the yellow. Possibly, I am going to rethink the actual corner colors. I did have a thought about adding borders to the corners to make them fit better, but I don’t really want to try to mess with that. I don’t mind too much about this setback. I DO really like the four corner colors that I have created. So much that I decided to complete the four corners as a small quilt of its own. 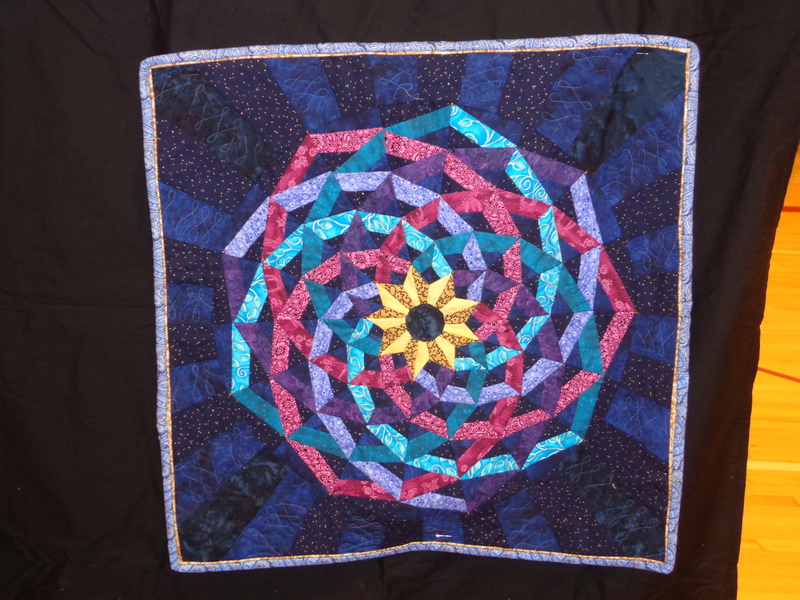 With a minor change with the inner star which I will highlight with the quilting stage. 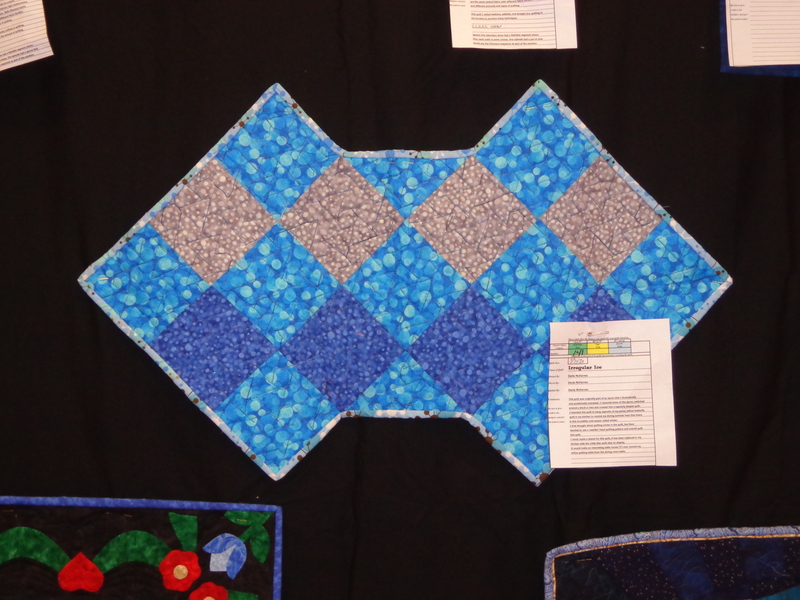 This is a cute little happy blue quilt. 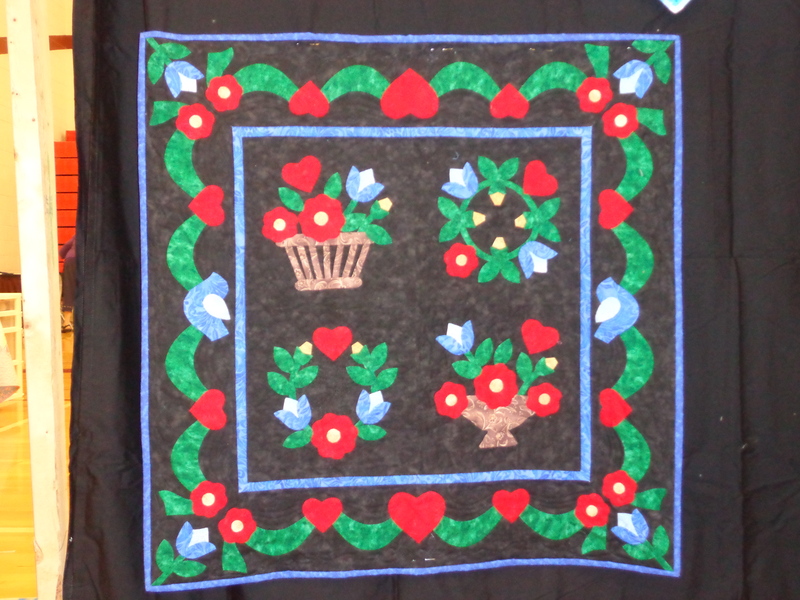 I will have a quilt plus the reverse of the same thing in the corners of the Dancing Ribbons quilt. With different colors. Just not destined for this quilt at this time. Very pretty! In my “year of FMQ” I have sat down and finally quilted this card trick quilt that I have had in the works since April of 2009. Making it my oldest UFO. I do realize that there still needs to be one small line I missed on the card trick block itself and the corners aren’t tacked down – said I would get to them later & forgot that I never finished them until after I put my FMQ foot away for the day. The card trick & square in square blocks are quilted on the top with a golden/orange contrasting thread. But the threads on the straight lines in the ditch around the blocks are much lighter – a light taupe for some of the straight lines. For the swirly details I decided to pick a color in between the lighter taupe and the golden/orange, and use a golden yellow color thread for quilting. Quilting is swirls and long feathers in a box around this section. And circles and a pinched block for the middle of the blocks. This quilting went rather well, and is the largest thing I have pushed through my Janome Magnolia machine. Not too hard to do, but too much bigger would be harder than this. A small amount of success for finishing the quilting. I have been weary of “overquilting” this quilt, but I think this one plays nicely with some curves and some straight line free motion quilting. I have basic straight lines in the borders. I could alternate with fills, but currently they are left plain, which is fine with me at this time. If you are a normal reader of my blog, you may recognize one, two, or even three of these quilts. Here they are. 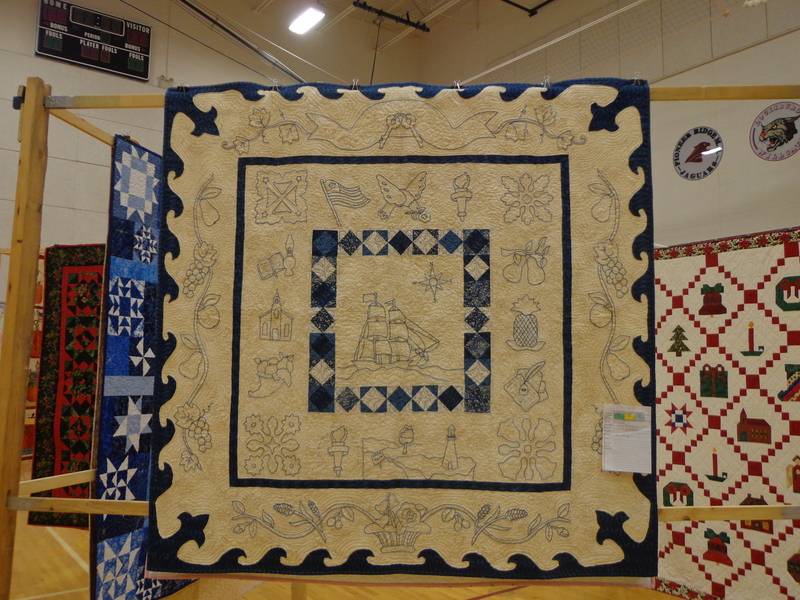 Most were in the “smallest” quilt category, competing against themselves for viewer’s choice. And they’re pretty much all wallhangings. First the most obscure quilt I’ve done. I called it “irregular ice” and it’s pretty much a table runner with a strange shape. But I think it’s the shape that makes this quilt cool. Ice to remind me of cold. 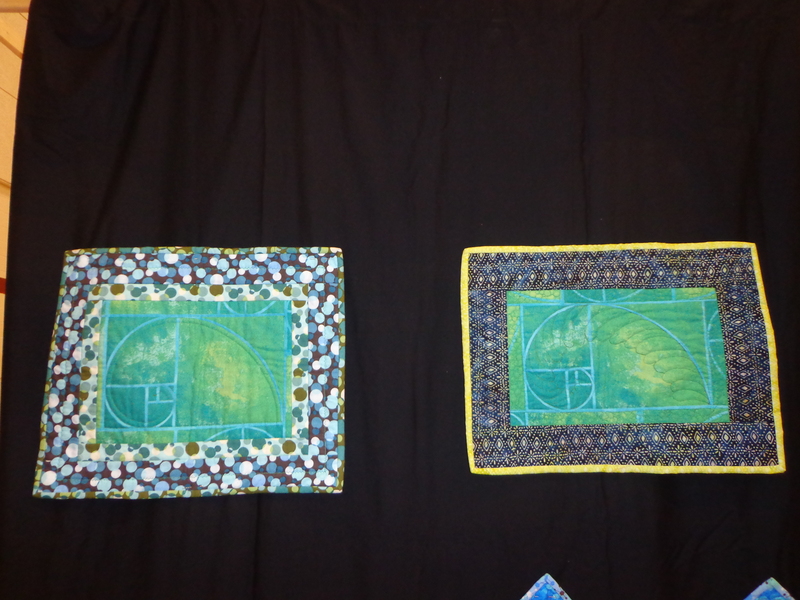 I was so glad they put the two Fibonacci quilts next to each other so they could be buddies. The only comment I got was on the feathers the one quilter who always wins awards and stuff said she liked my feathers. 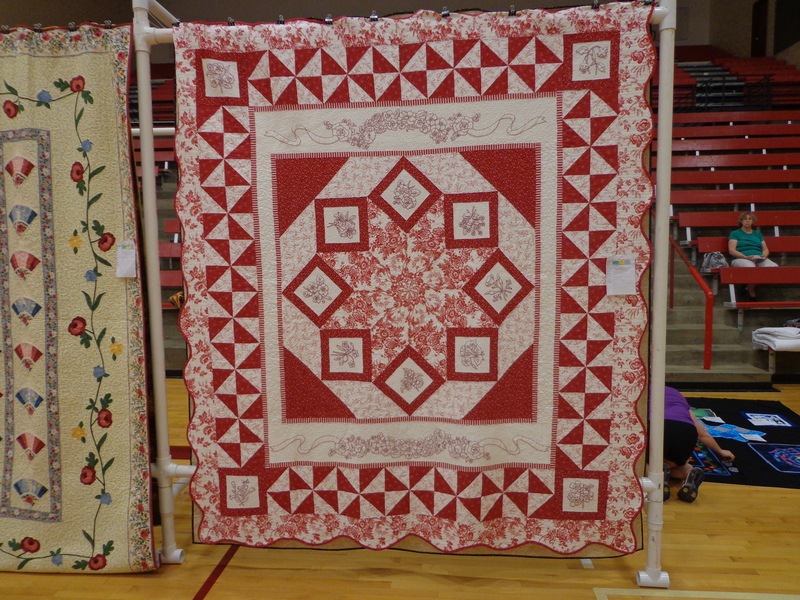 I like the juxtaposition of the two differences together, one with lots of quilting one with a lot less, and the change of the borders to see how different that is with the same center fabrics. These quilts make me feel like an “artist”. 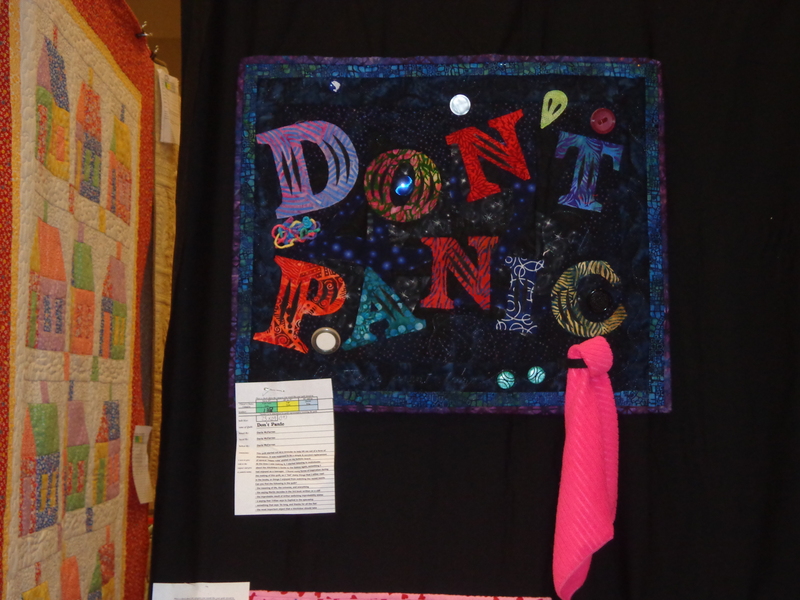 I have a small story to show and share later about this quilt, but here it is as it was hanging in the show (it’s changed since then a week or two ago). Third quilt I ever done. I love this quilt, this baltimore album quilt (Mimi Dietrich) that is the first headlong plunge directly into the world of hand applique. Whee. 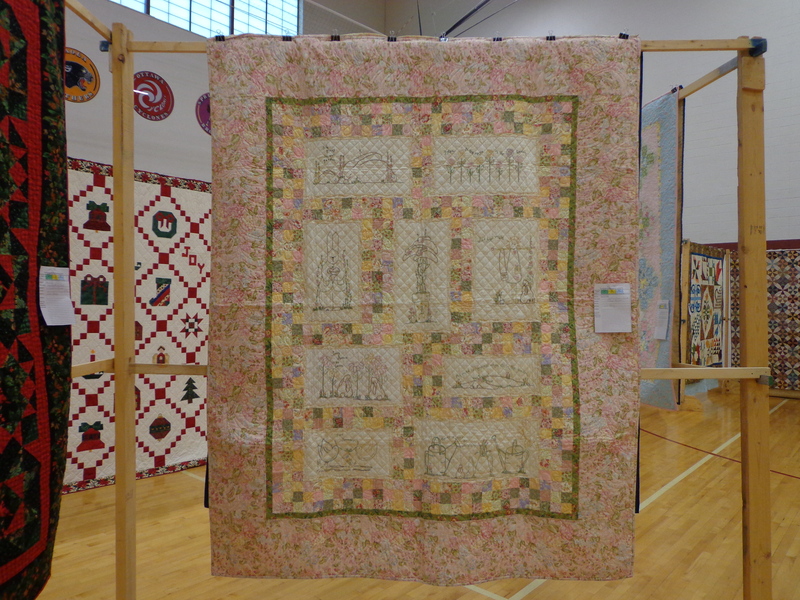 I think that the Dancing Ribbons quilt has been talked about and shared a lot on this blog, but then again, a large portion of it was done during last spring & summer (2012). The hanger fell off my door and so currently need to rehang this quilt. I figured out a lot of things that I hid in this quilt. I made a list and asked the questions on the description page to the quilt viewers. This was placed a tiny bit high so I don’t know if a lot of people read this description or tried to find all the things. 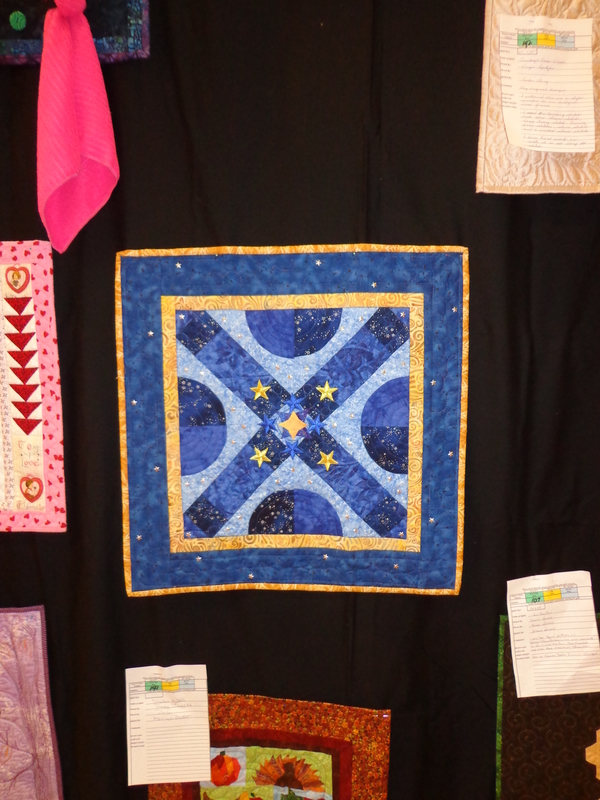 I loved getting a chance to see the back of my Exothermic Wonders quilt. 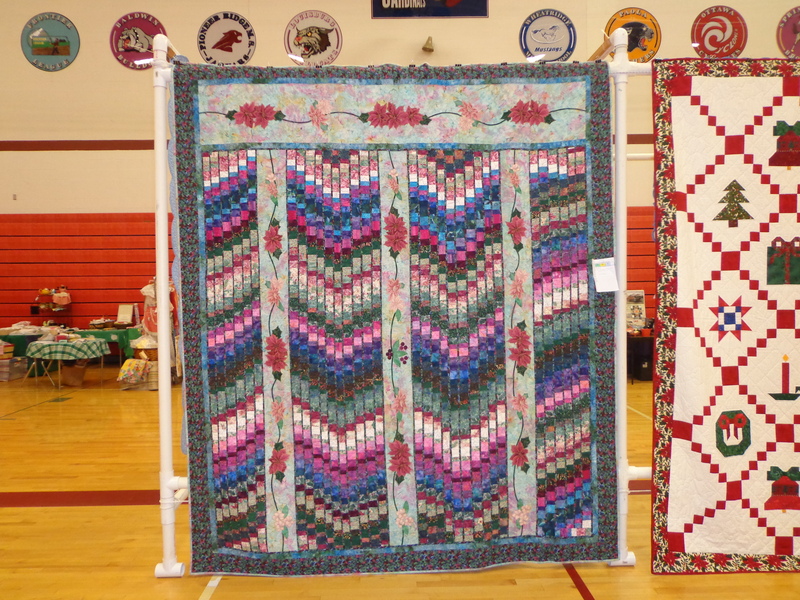 Love the freeform piecing of this section with the quilt leftovers. And of course, you gotta see the front side too which is now the center picture on my ipod. Which is the largest quilt to date I’ve ever ever done. And LOTS of work. Well I hope you enjoyed the quilt show that we had. Feel free to pin back to the posts about the show.